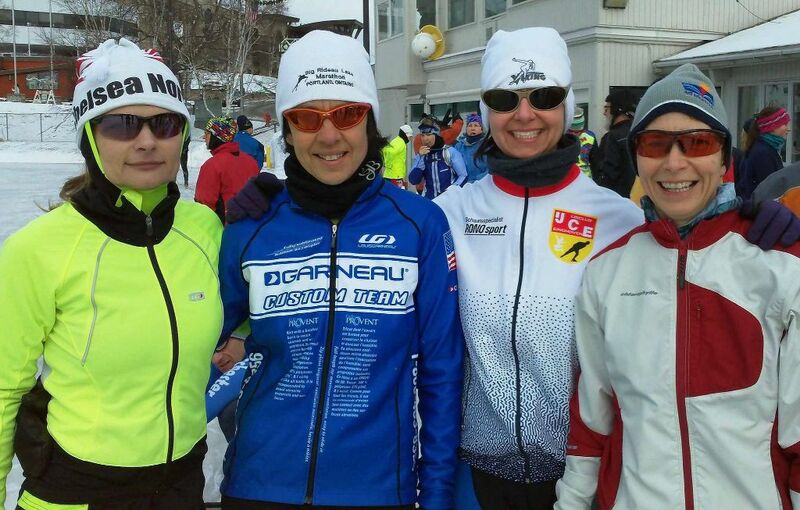 The inaugural marathon weekend marathon for Lake Memphemagog at Newport Vermont was held on the March 1/2 weekend. A week before the event we didn’t know if there would be such a skate as the organizers didn’t know if they could provide decent ice, having never organized such a skating event. It was only by luck that the MSI (Marathon Skating International) president, Neal Hundt, had stopped by two weeks earlier on his way to the Quebec Plains of Abraham marathon to grab a bite to eat and that he caught up with Phil White. Phil is the local ‘mover and shaker’ when it comes to organizing long distance events for Newport and after talking to Neal decided that maybe they should add speed skating to the list (along with in-line, swimming and cycling). 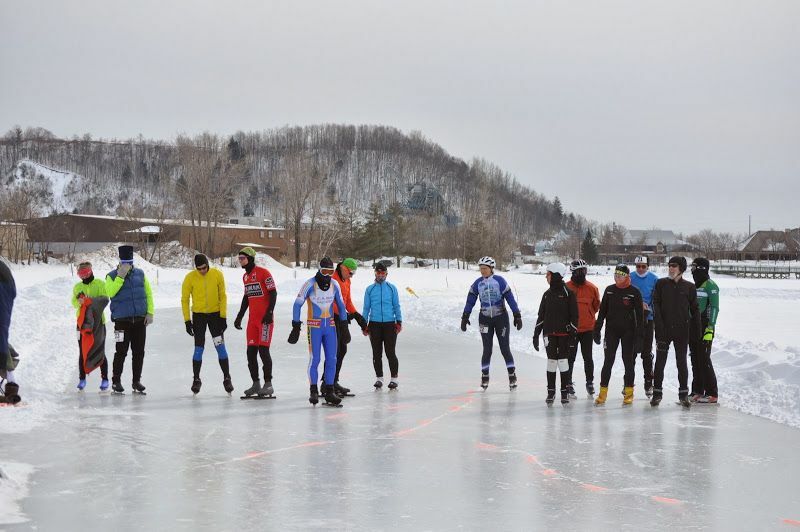 In two weeks they had an organization established with plenty of willing volunteers and proceeded to develop an excellent 700 meter oval on the lake. We had 1,5, 21 and 42km events. For the latter two events, due to the short notice, the field of skaters was small, however, very enthusiastic. Those who attended (about 23 skaters in the longer events) had nothing but praise for the organization and the quality of the ice. Most skaters were from the US with four of us (including Heidi and myself) from Ontario and two from Quebec. We all had a good time and the restaurant at oval-side provided a wonderful seafood buffet on the Saturday nite. The same first class local craft beer as we experienced at Lake Champlain last year was available on tap here as well. The competition was of a high level and both Heidi and I came away with a wonderful prize of free registration for next year’s event. This prize was not for winning a race, but for being the last ones in the ‘barn door’ following the 42km race. Although we both skated personal bests, the competition for this event was of very high caliber. All agreed that Lake M. will be on our personal calendars for next season. 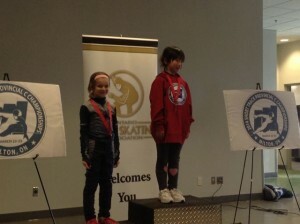 Congrats to the skaters who competed in the Provincial C Championships this past weekend. Here are the official results. The official protocol can be found on the OSSA website, under the racing category. The PB page will be updated after this weekend’s Provincial B Championship. Good luck to those who will be skating. This past weekend, 5 skaters made the trip to Milton to participate in the Provincial C Championship. Overall, it was a great weekend of skating, with each skater getting new PB’s in several distances. 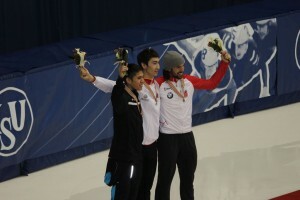 In the end, 2 of our skaters finished on the podium. 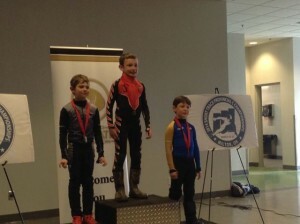 Congratulations to Andy Giroux for winning Silver in the 7 year old boys category. Congratulations to Celia Giroux for winning Silver in the 6 year old girls category. Official protocol will be posted soon. The ISU World Speed Skating Championships were held this past weekend in Montreal. Several SLSSC members made the trip to enjoy the excellent racing. While there, Coach Jen ran into an old competitor, namely Kristina Groves, who was announcing for CBC!!! Kristina was nice enough to pose for pictures with Jen, Nolan and Paige, as well, sign their programs. Coach Jen’s brother also managed to get the programs signed by the complete Canadian Speed Skating Team! Congratulations to Charles Hamelin for winning Bronze in the 500m. With the Braves hosting a playoff game this Tuesday, our ice times have change. Note: Both Coach Jen and Coach Gerald will be there for the Comp session. 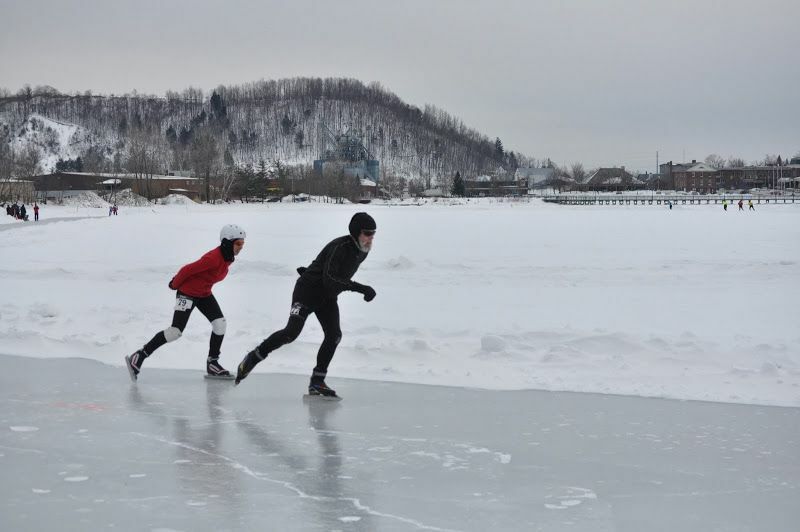 The marathon season extended from mid-November opening up with the Quebec City marathon that is held at the Gaetan Boucher oval in St. Foy and ended with the inaugural Lake Memphemagog marathon weekend at Newport, Vermont on the first weekend of March. In between we had several others including Lake Placid, Skate the Lake (Portland, Ontario) and Plains of Abraham, with one marathon being cancelled in mid- February at Lake Placid. In addition to these ‘local’ marathons there were marathons on the Halifax oval and two in Alberta (Silver Skate in Edmonton and Sylvan Lake near Red Deer (this latter event was moved to the Red Deer oval due to unfavourable ice conditions on Sylvan Lake). 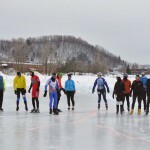 The events were well attended with the exception of Skate the Lake as a result of very poor and hazardous driving conditions for intended participants, and Lake Memphemagog due to short notice. But all were successful and enjoyed by all who attended. 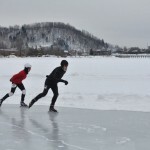 This year the North American marathon championships were held in our backyard at Portland (Skate the Lake). Our club was well represented at the NA championships with 15 of our members entering the various events. Heidi attended four of the five marathon events in our region and John participated in all five (ten races). It was unfortunate that the second Lake Placid event was cancelled due to hazardous driving conditions since eight from our club were signed up to participate. Better luck next year and hopefully we will attract more club members to a suite of events in 2014/15. Reminder, the following Provincial Champions will be coming up in the next few weeks. Make sure to get your entries to Heather by the specified date. Provincial ‘C’ (Girls and Boys age 6-10) – March 22nd-23rd, Milton. Entry form due by March 12th. Please let your coaches know if you plan on attending this meet. Provincial ‘B’ & Masters (Girls and Boys 11 and up that do not skate in the Provincial Series, including Masters) – March 29th-30th, Clarington. Entry form due by March 19th. Congratulations to Nick Everett for finishing 13th at the Ontario Winter Games in Huntsville this past week. You can follow the link to see the protocol. 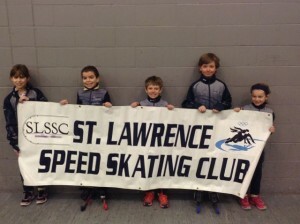 Congratulations to the 24 skaters from St. Lawrence that competed in the Eastern Regional Meet #5 this past weekend. 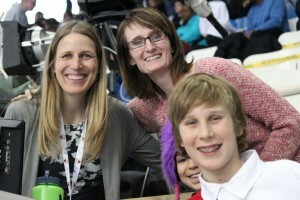 A fun time was had by all, with many skaters achieving new PB’s (PB page has been updated). Thanks to everyone who helped with the meet and brought food/supplies!!!! I think we served our officials, volunteers and coaches a good lunch and snacks!! 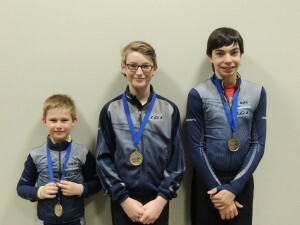 Congrats to Aidan VanBeek and Arie Devos for winning Gold in their division and to Andrew Chartrand for winning Bronze in his. The protocol can be found on the OSSA website. Videos from the meet can be found on the Eastern Ontario Network website.